This attractive, midblock structure has a handsome entrance marquee and a two-story rusticated limestone base with sidewalk landscaping and flanking lanterns. It was designed by James E. Carpenter and Rosario Candela, two of the foremost architects of luxury apartment buildings in the 1920s and 1930s in Manhattan. The 25-story building was erected in 1927 as a residential hotel and subsequently became the Ritz-Carlton Hotel and then the Intercontinental Hotel. 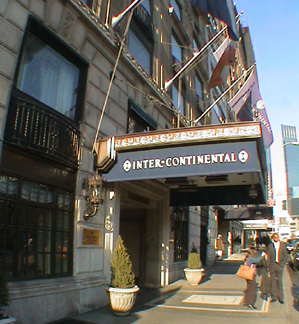 In a May 14, 2004 article in The New York Times Rachelle Garbardine reported that the Intercontinental Hotel would cease operation at this location in June, 2004 and be converted to an apartment building. Stephen L. Glascock and his wife, Barbara van Beuren, are architects and the principals of Anbau Enterprises of Manhattan, the developers of the residential conversion. Costas Kondylis & Partners is the architectural firm handling the $110-million conversion. The $110 million conversion by Anbau Enterprises added three floors to the building, which now has five penthouses with some fireplaces. Three of the penthouses occupy full floors of about 4,000 square feet each. The principals of Anbau are Stephen L. Glasock and Barbara van Beuren, both architects. The penthouse on the 24th floor has four bedrooms, four baths, a powder room, a fireplace, and terraces. The penthouse on the 27th floor has two bedrooms, two baths, a powder room, and a 50-foot-long loggia and terrace. The duplex penthouse on the 28 and 29th floors has two bedrooms, 50-foot-long loggias on both levels, and two fireplaces. The Times article indicated that the apartments will be marketed as co-operatives, "though without some of the restrictions normally associated with co-ops." "A key reason No. 112 will become a co-op is that Anbau rents, not owns, the land beneath the building," the article continued, adding that the new apartment owners "will not need board approval to sell or sublet their units." The Intercontinental Hotel had 211 guest rooms including 23 suites and some function rooms with working fireplaces. The 25-story building had a restaurant and a cocktail lounge and a business center. This block, between the Avenue of the Americas and Seventh Avenue, is the most elegant on Central Park South as it boasts the great Art Deco rooftops of the Trump Parc building on the east end and the Essex House midblock as well as the spectacular, green mansard roof of Hampshire House midblock and the imposing Italian-Renaissance-palazzo-style New York Athletic Club on the west end. Like all Central Park South buildings, this building has great vistas of Central Park and the skylines of Upper Fifth Avenue and Central Park West. The building has a doorman and a garage, but no sidewalk landscaping. Good public transportation is nearby as well as excellent shopping and numerous restaurants. Historically, Central Park South was for many decades an surprisingly unattractive location despite its great location because of its narrow sidewalks, high traffic, a proliferation of street people who patronized guests at its many hotels and a lack of normal residential neighborhood amenities. At the end of the 20th Century, however, its ambiance improved significantly with the erection of several new luxury towers nearby and the opening of new restaurants and a supermarket not too far away and the long-delayed redevelopment of the New York Coliseum site at its western terminus where the Time Warner Center opened in early 2004. In 2006, the building was converted to a residential condominium and several penthouse floors were added by Anbau Enterprises. The conversion plan permitted the purchasers of its 63 apartments to sell or sublet their apartments without board approval much like a condominium. The 28-story building has five penthouse units and apartments ranging in size from one- to four-bedrooms. The building has an ornate and handsome entrance marquee, a 24-hour doorman, a concierge, a live-in resident manager, a fitness center on the second floor with an outdoor terrace and breakfast bar and a basement laundry room in addition to washers/dryers in all apartments. 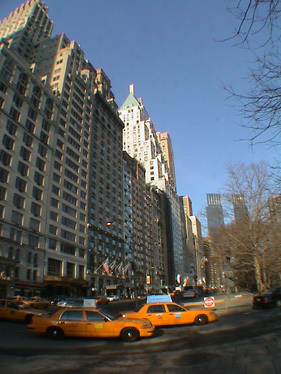 The building, which is between Avenue of the Americas and Seventh Avenue, was most recently the Inter-Continental Hotel and prior to that the Ritz-Carlton Hotel. It was erected by Samuel Minskoff in 1925 as the 25-story Navarro with 118 hotel-apartments. In the 1880s, Jose de Navarro built eight connected buildings, 10 stories high, that were known as the Navarro Flats that included the present site as well as those now occupied by Essex House, Hampshire House and the New York Athletic Club. Eventually this site was occupied by the Deutscher Verein, a German social group housed in a palazzo-style structure designed by McKim, Mead & White. That building eventually became the Army & Navy Club until it was replaced by the present building. One of the early residents of the building now on the site was Bennett Cerf, the publisher of the Modern Library and Random House. Other residents over the years have included Raymond Loewy, the industrial designer, and Earl Carroll, the nightclub impresario. The building has a six-story limestone-clad base with pilasters between the 3rd and 5th floors. It has discrete air-conditioners and offers storage space and valet parking. Kitchens have Poggenpohl cabinetry, SubZero refrigerators and Miele cooktops and Asko washers and dryers. Bathrooms have sycamore vanities with marble tops, Kaldewei bathtubs and frameless glass shower enclosures. Gustavo Martinez designed the building's model apartment. One-bedroom, one-bath and powder room units range in size from 1,026 to 1,039 square feet. Two bedroom, two full baths and a power room units ranging in size from 1,849 to 1,971 square feet. Three-bedrooms, three full baths and a powder room have 2,391 square feet. Anbau is German for "to add onto," or, "to build onto."